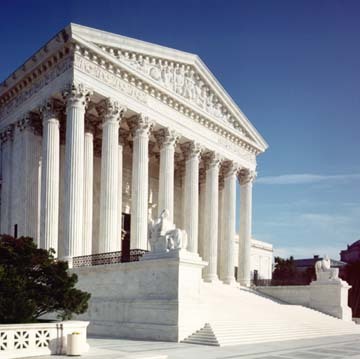 On June 29, the U.S. Supreme Court held (5-4) in Glossip v. Gross that Oklahoma inmates "failed to establish a likelihood of success on the merits of their claim that the use of midazolam violates the Eighth Amendment." Three inmates on Oklahoma's death row had challenged the state's use of midazolam as the first drug in a three-drug protocol, saying that it "fails to render a person insensate to pain." In a narrow decision written by Justice Samuel Alito, the Court deferred to a District Court ruling upholding the use of midazolam. Justice Alito said that, in order to prevail, the inmates would have had to identify a "known and available alternative method" that has a lower risk of pain. The decision will allow states that use midazolam, including Oklahoma, to resume executions, though they can still consider alternatives. In a sweeping dissenting opinion raising deep concerns about the death penalty itself, Justice Stephen Breyer, joined by Justice Ruth Bader Ginsburg, said, "I would ask for full briefing on a more basic question: whether the death penalty violates the Constitution....Today’s administration of the death penalty involves three fundamental constitutional defects: (1) serious unreliability, (2) arbitrariness in application, and (3) unconscionably long delays that undermine the death penalty’s penological purpose. Perhaps as a result, (4) most places within the United States have abandoned its use." (A. Liptak, "Supreme Court Allows Use of Execution Drug," New York Times, June 29, 2015; Glossip v. Gross, No. 14-7955). Dale Baich, one of the attorneys for the Oklahoma inmates, reacted to the Court's ruling, stating, “Today's ruling, which allows departments of corrections to use midazolam in lethal injection executions, contradicts the scientific and medical understanding of the drug’s properties. Because the Court declined to require that states follow scientific guidelines in determining their lethal injection procedures, states will be allowed to conduct additional human experimentation when they carry out executions by lethal injection. “Despite the Court's unwillingness to step in on this important issue, and given the substantial risk of harm, litigation surely will continue. We will continue to work in the courts to hold the states accountable in order to try and prevent botched executions in the future.” (Press Release, Attorneys for Richard Glossip, June 29, 2015). See Lethal Injection and U.S. Supreme Court.